HAVANA (Reuters) - A rare tornado ripped through Havana late on Sunday, leaving at least four dead and nearly two hundred injured as it tore off roofs, flipped vehicles and reduced some of the buildings in its path to rubble. The twister was the strongest to hit Cuba in nearly 80 years, according to Jose Rubiera, a meteorologist with the Cuban weather service. It pummeled its way 7.15 miles (11.5 km) through Havana over 16 minutes, at times reaching 0.62 miles (1 km) in diameter. 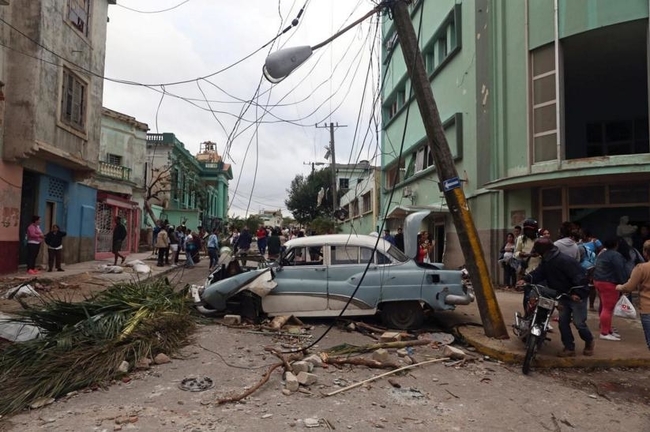 The streets of the worse-hit neighborhoods, mainly in eastern and central Havana, were strewn on Monday with shards of glass and debris as well as downed trees and power lines. Some areas lacked electricity and running water. Infanta Rodriguez said her family had huddled in a corner of their home like Russian nesting dolls as the tornado sucked off the roof - she sheltered her 12-year-old son and her husband sheltered her, taking the brunt of the flying debris that scratched and bruised his back. “All we have left is the skeleton of the house,” she said. Like many of her neighbors in the capital’s eastern, working-class borough of Regla, the tornado had smashed most her belongings while the rain had destroyed her appliances. President Miguel Diaz-Canel toured Regla shortly after the tornado hit and tweeted a preliminary death toll of three, that the state-run news broadcaster updated to four in the evening, adding that 195 were injured. One Regla resident, Odalys Diaz, 51, said her neighbor was killed when the roof of a nearby five-storey building came crashing down onto his which then collapsed on top of him. Concrete debris also smashed into her flat, tearing down the wall of one room and shattering the windows. “There was glass flying everywhere. I tried to hide under the bed,” Diaz said. The devastation wrought suggested it was an “EF4” tornado on the Enhanced Fujita scale, the second most powerful category with winds up to 200 miles per hour (322 km per hour), Rubiera told state-run news agency Prensa Latina. “When I rushed up to the first floor to look for my mother, I found this disaster - the roof and front wall had gone, and she’d fallen into the street,” said Victor Leiva Ramos, 41. Leiva Ramos, who was injured while trying to find her in the rubble, including a severed tendon, had his arm bandaged. His 73-year-old mother survived with a few fractures. Cuba prides itself on suffering relatively few deaths in hurricane season due in part to a rigorous evacuation scheme. Yet the tornado took Havana by surprise, although state-run media had warned residents that an approaching cold front from the north and winds from the south would create high winds, thunderstorms and heavy rainfall in the area. Rubiera was later cited as saying that such phenomena were virtually impossible to predict when they affected such concentrated areas. Diaz-Canel said the council of ministers had held an emergency meeting early on Monday to assess the damage and take the necessary steps to speed up the recovery work.